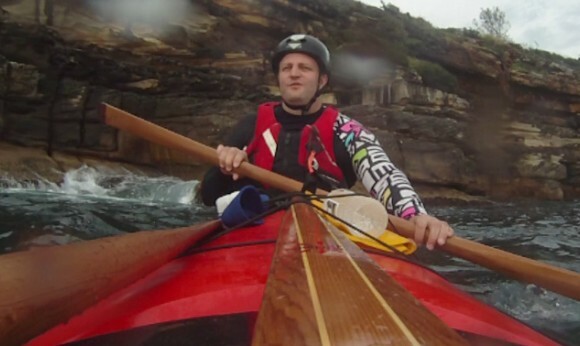 Important rules when paddling near cliffs - always wear a helmet... and an ugly shirt. 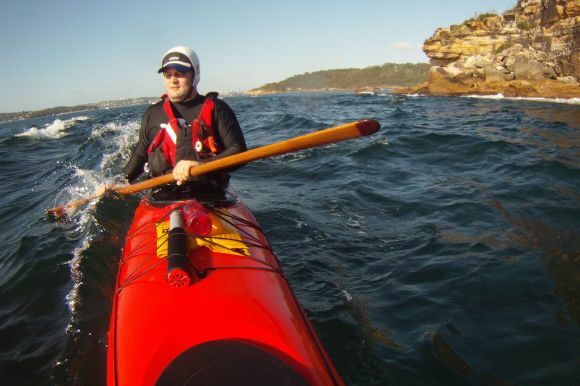 With my usual paddle mates either away for the weekend or too hungover to get out on the water, I took off for a solo paddle and decided to go and explore the cliffs of the Harbour’s Middle Head. 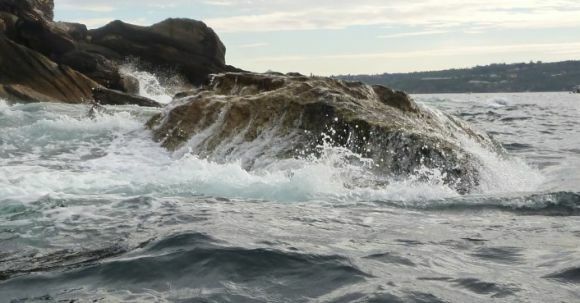 This rocky outcrop separates Middle harbour from the main part of the Harbour and is exposed to the open swell coming in through Sydney’s Heads. 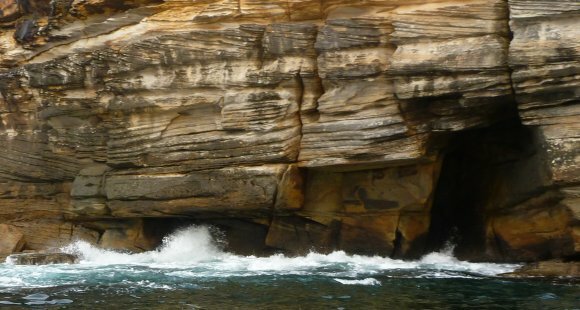 Rock shelves in front of the cliffs create sections where the incoming swell jacks up suddenly before breaking violently against the rocks. It’s a truly beautiful section of the Harbour. When water meets rock, all sorts of unexpected things can happen. Be careful in this zone! 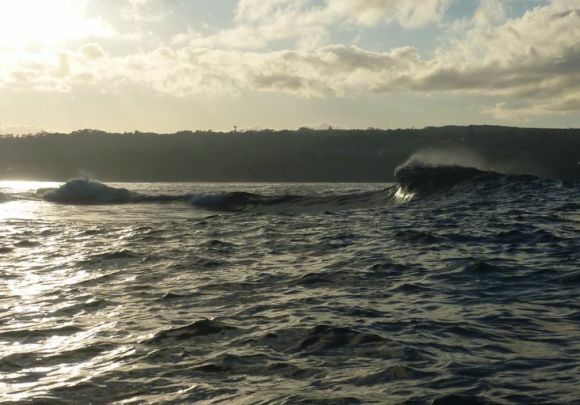 The ocean was fairly calm with swell no more than 1 metre coming through. 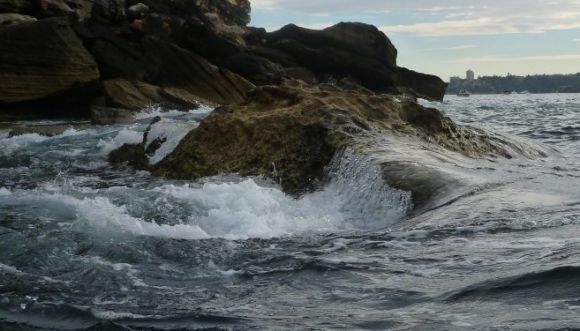 Bobbing around 5 metres out from the cliff, I’d rise over the waves as they came in and then bob around as the rebound returned heading back out to sea, enjoying the ride and the incredible aqua colours of the bubbling aerated water. 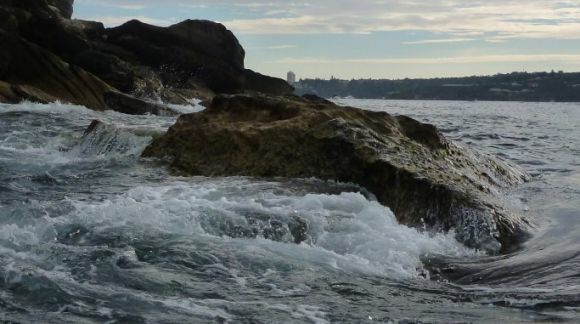 I moved around to the south east of Middle Head which catches swell a little more violently than the rest of the cliff. There I found a good sized rocky outcrop jutting up a few metres out from the cliff. The waves would rush over the top of the rock before swirling back around it creating little whirlpools and eddies, and I paddled up close mesmerised by the wonderful spectacle of water changing form as it was pushed and pulled across the rocky structure. It was simple, harsh and beautiful. ...creating dynamic whirlpools and flows across the nearby cliff-face. I then paddled back past the cliff to a section with a decent rock-ledge under the surface. I watched as seemingly small swell suddenly tripled in size before sucking the legde dry of water as it broke across the craggy cliff base. 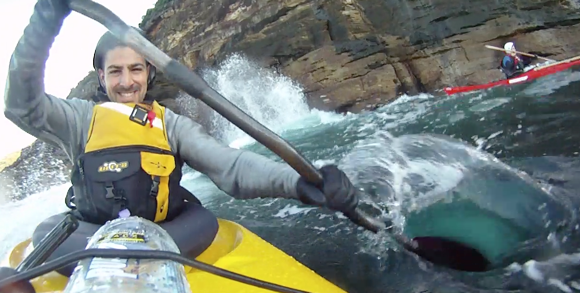 This was an incredible sight and I fairly quickly learned two very important rules about paddling near cliffs. (b) Check behind you at regular intervals. I learnt this because as I drifted taking photos of the cliff, I suddenly heard behind me the slow building roar of a wave that is sucking water into itself just before it breaks. Looking behind me, I suddenly realised I’d drifted right into the break zone, and was about to be smashed broadside by an incoming roller. Fortunately my old rugby reflexes kicked in straight away and I did the only thing I could think of in the split second before being punched by the wave – I tucked my head in and dropped my shoulder straight into the face of the wave. 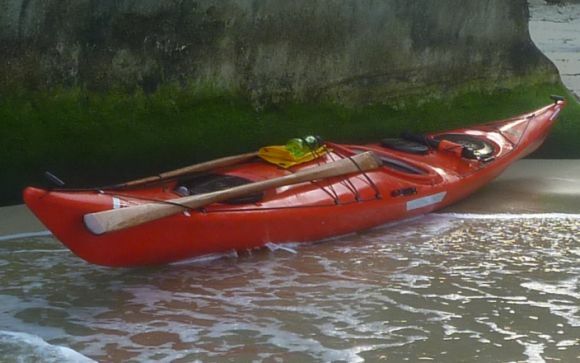 Incredibly the weight behind this manouver somehow carried me through the wave, and with a relieved laugh, I paddled a little further out to the safety of deeper water. The last thing I saw before turning to face the breaking wave. I decided to get a little more actual paddling in so I rode the swell and boat chop across the sound to the cliffs of Grotto Point Reserve. 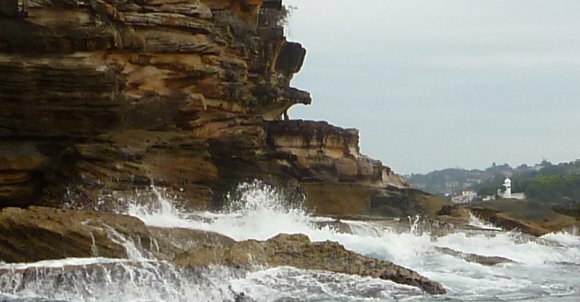 I cruised the cliffs there until I came to the Dobroyd Point bomborra, another zone with a hidden rock ledge that can create incredible waves when the swell is right. For the most part it wasn’t doing anthing, but ever now and then a decent sized swell would roll in creating a beautiful 6 foot high bowl-shaped break across the ledge. I kept the kayak on the edge of the break zone for a while whilst watching these incredible waves roll in. Dobroyd Point - a beautiful little break across the rocks. Ya, that’s one ugly shirt! Now you know why I hug the rocks when I train on my ocean racing surf ski. Yes, the big open ocean when there’s a 5m swell is simply awesome, but even a flat’ish day hugging the rocks in the harbour is fun. I don’t care what anyone says… if you’re paddling at pace 1 to 2 meters off the cliff face moving in and out with the wash and swell, you’re having fun and the adrenal gland is working in overdrive state! Are you selling that shirt? size XL? Ha! Sorry Roger, the rash shirt is by Quicksilver, but it’s a few years old and it doesn’t look like they are still selling this design. Does that shirt smell like the 80’s as well?